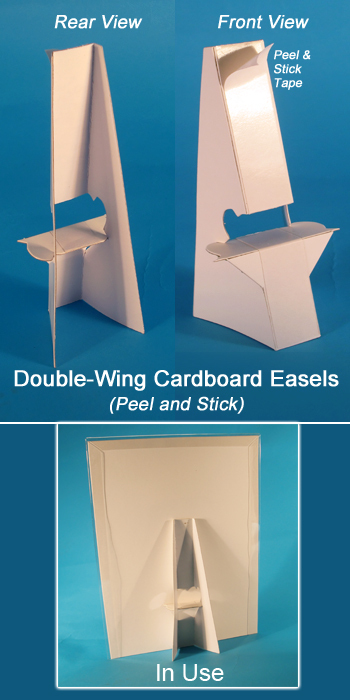 Self Stick Cardboard Easels | 12" Double Wing Paperboard Slant Back | Counter Sign Holder | Clip Strip Corp.
Self-Stick Cardboard Easel provides strong, lasting support for countertop signage displays featuring any one of our print protectors or any one sided sign that can be mounted onto its adhesive backer. Clip Strip Corp. carries a full line of counter and tabletop literature and sign holders for all your in-store or business communications needs. Acrylic, PVC, Cardboard, flat, folded, T-style, slanted, self-stick, we should have what you require. If unclear what will work best for you, call our experienced and always friendly customer service team Toll Free at 1-800-4-CLIP-STRIP (800-425-4778) and we will be glad to help you chose.